Pirate Tales is a 3-reel 3-row 20-payline progressive jackpot video slot machine released in autumn 2018 by Magnet Gaming that features 3 unique and entertaining interactive rewarding bonus features including Treasure Island, Pirate Plunder and Set Sails. Explore the Caribbean islands and search for hidden gems worth no less than 192.000 coins, but also try to get the most for your Wilds, Scatters and Free Spins. Join the crew and bring some proven tips to show your valor after reading the Pirate Tales slot review. We have no free play mode available yet, but take a look at the Pirate Tales screenshots instead. Or why not simply giving a try with one of the recommended casino sites above? To receive a payout, try to collect 3 symbols of the same kind, where the paytable grants more money to themed icons. Your faithful yellow parrot talks much but pays 12.000 coins, while the Coin Sack, Skull, Anchor, Ocularium and Sword bring between 800 and 5.200 coins. Always remember that the coin value is fixed at €0.01, while paylines are adjustable allowing punters to place bets on 1 to 20 levels. This makes room for each player to arrange his own strategy and wager between €0.10 and €8 per round, according to his ambitions and experience. With 3 Game Chance symbols, you’ll activate 1 out of 3 Pirate Tales Bonus games described below, but also receive a big win of 32.000 coins. This is also an interactive round where you will be shooting from canon and win the prize written on the only part of the ship that has left. A winning combination grants not only the amount of cash but also 1 extra spin and increase the Multiplier level from 1x up to 5x. The Jackpot Flash prizes vary between 5.000, 12.500 or 20.000 coins, while the Super Jackpot Flash may boost your balance with 30.000 all the way up to 160.000 coins. Speaking the more understandable language, winners will collect prizes starting from €1.000 and €15.000, respectively. 1. What kind of special features can you expect? 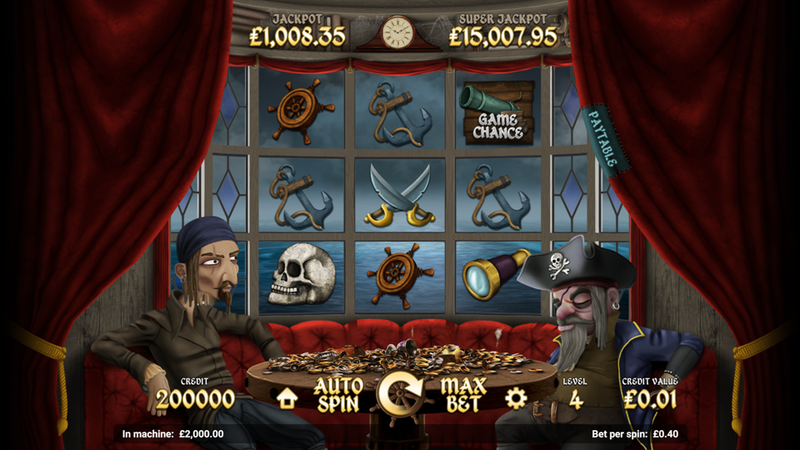 The Set Sail mode comes with 25 Pirate Tales Free Spins during which prospective winners will collect the rudders and score 250, 375 or 750 coins, while every fifth barrel comes with 1 Jackpot Flash. Treasure Island brings a map with 20 question marks and 10 choices for each player. Your task is to dig for the trinkets with those choices and reveal 625 to 1.250 coins, extra choices, Jackpot Flash or valuable objects such as map or rubies. Finally, the Pirate Plunder mode has 17 barrels spread over the board and a compass spinning to the following prizes: 2.500 to 10.000 credits, 2-4 extra turns and 1-2 Super Jackpot Flashes. 2. Are there any limitations when playing on a mobile device? You can play online on the Magnet Gaming powered sites without a need to download an app or the .apk file for Android or iPhone. Pirate Tales free play is also available. 3. What is the RTP factor of Pirate Tales? According to the official info, the RTP is 96.50% and is approved in the Pirate Tales recension. Nicely animated and with more prizes than anyone could expect, this is a game that skillfully balances between newbies and players with more experience. Even though the house has a slight advantage, we suggest you to implement all Pirate Tales tips and improve your winning odds. Please gamble responsibly. You must be 18+ to use this site.